I didn’t manage to write about our August trip before we took our September one; no time like the present. Compared to our ten day July trip that I wrote about last time, this was a longer and more complicated journey. Mr. K and I set out on August 9th and drove to his sister Kathy’s house in Washington (which took way longer than it should have thanks to a long back-up on I-5). The next day, he and I and Kathy picked up a 30 foot RV in Everett and drove back to Idaho, spending our first night as RVers in the driveway at a friend’s house in a city we’d driven through the day before on our way to Kathy’s. It was not the most restful night. The friend wasn’t home (but had said we could use his power outlet and water faucet on the outside of his garage), so we had no indoor plumbing available. The RV had a toilet and shower, and they worked fine; I just worried about filling up the waste tank (I needn’t have, but that never stops my brain). We were also testing out the various sleeping surface options, so I was around four or five feet in the air above the driver and passenger seats all night, having to be careful not to put a foot wrong when I clambered down. This particular RV had no stabilizer things to put down, so whenever any one of the three of us moved the whole vehicle seemed to rock a bit. 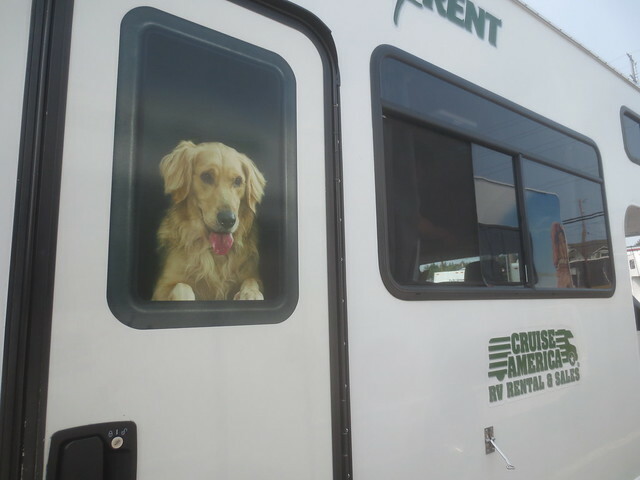 My favorite part of this first RV day was the dog decal in the window. The next day we drove and drove, pulling into a campground in Hardin, Montana well after dark. We had a better night’s rest since we knew our way around the RV better by now and weren’t surprised by the sounds and movement. The next morning we woke up, used the camp’s showers, packed up, and drove and drove some more, getting to a campground near Mitchell, South Dakota, again past dark. 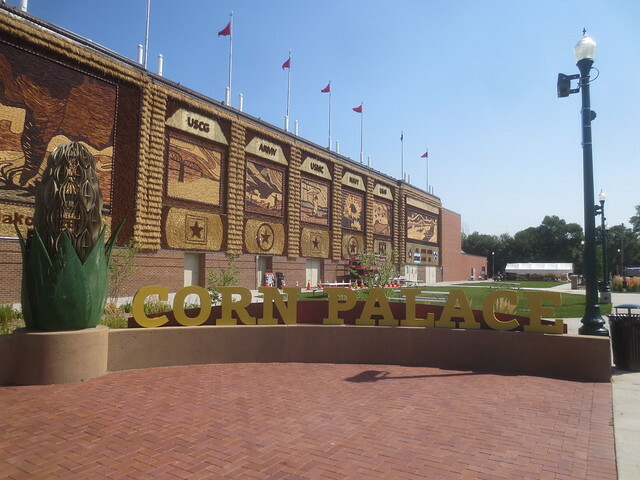 In the morning, we decided to go see the Corn Palace before driving the last 550 miles to my mother-in-law Joan’s house. On our short drive to get there, we saw a car driving the wrong way on the freeway. Fortunately she was in the left lane and we were in the right; I looked in the mirror after she passed and saw a truck in the left lane swerve to avoid her; as we were getting off the freeway, a police car with lights and siren going got on. It was scary. (And very sadly, it was also deadly for one person caught in a second crash in the backup from the accident the wrong way driver caused, though we didn’t know that until later.) As for the Corn Palace, they were in transition from 2018’s theme of South Dakota Weather to 2019’s Armed Forces. We made it to Joan’s as planned, and had something like 36 hours there to help her pack and say goodbye to the care worker who’d been coming five or six days a week to help her out with things for the last several months. Then we four piled in the RV and drove to Arkansas, where we met up with Mr. K’s other sister, Fay, who’d flown in from Michigan. We spent a few nights in a hotel there, attending memorial concerts in honor of Joan’s sister in the evenings (similar but not the same program, in two different venues on back to back nights) and most of us having very delicious pie and other baked goods at a local pie shop in during the day (most of us also did some walking during the days but that wasn’t nearly as interesting as trying pie flavors such as Blueberry Buttermilk and Salty Honey). The morning after the second and final concert, the now five of us (me, Mr. K, plus his mom and both of his sisters) loaded into the RV and headed off toward Kathy’s house in Washington. 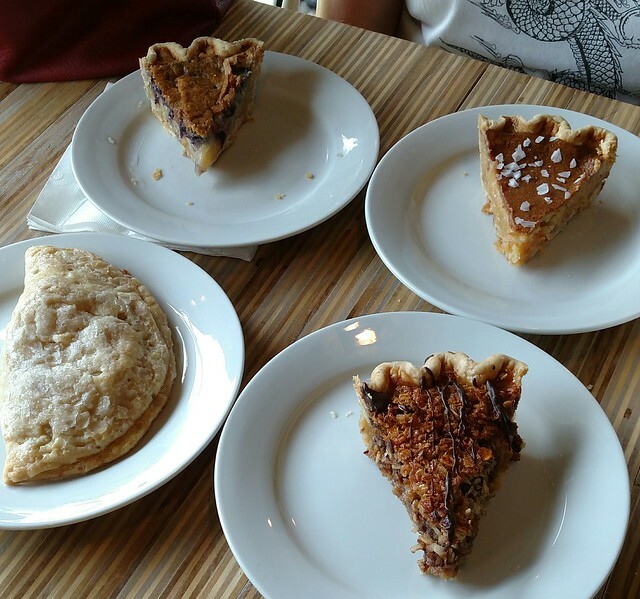 Our long stop of the day was for dinner and pie at a place touted as having the best pie in Kansas on one of the internet lists we’d found. I was good, but not as good as the Arkansas pie. Continuing tradition, we got to our campsite in Kansas that night after dark, and this time it was raining, which made it more challenging to get set up and settled. The next day we stopped for ice cream on the way to visiting the town in Colorado where Mr. K’s family had spent many a summer vacation when the kids were young. We again got to our campsite after dark, and this time found someone already in the spot we’d been assigned per the paperwork we picked up from the after-hours check-in. We pulled into another spot nearby and called it good; this being the internet era, I sent an email to the campground manager letting them know, in hopes of preventing an early morning knock at the door when they found a rig in a random spot. It wasn’t raining, and we all knew how the setup and breakdown of the sleeping spaces went and it was a better night than the one before despite the site mixup. The next day saw us leaving Colorado and driving through Utah, where we did another dinner and pie stop guided by those internet lists; this one was not as good as either of the previous two places, and had a confusing dessert board that mixed pies and cakes and tarts all together. We ended up that night in a more rustic campground than any on the trip so far (yes, after dark) , as it was the only thing anywhere near where we wanted to stop. The next day was a long one as we pushed all the way through to Kathy’s house, arriving around 2 a.m. even though we didn’t make any long meal stops but instead picked up quiche and desserts from a shop that was on one of those pie lists but didn’t have any sweet pie at all, just the quiche. Mr. K and I had slept in the RV when we’d stopped over at Joan’s in Illinois, but at Kathy’s that wasn’t possible due to the slope of her street, so we camped in her family room instead. The two of us cleaned out the RV the next day then returned it. 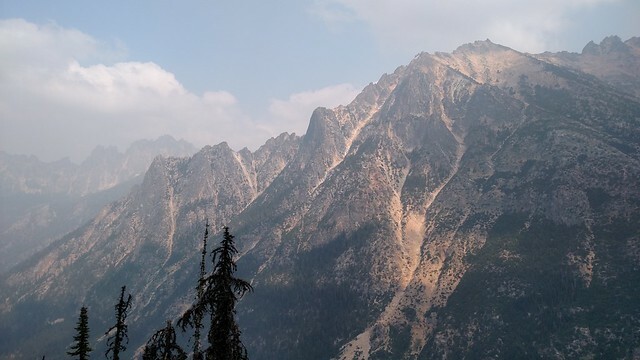 We spent another day relaxing and visiting before driving home to Idaho, taking the scenic route even though the views were somewhat diminished by the ongoing wildfire smoke. We pulled into our driveway on August 24th, a little over two weeks from when we’d left. Fay spent another couple of days in Washington after we left, getting to tour some retirement communities (and revisit some we looked at last winter) with Joan and Kathy now that the time has come for Joan to make that move. 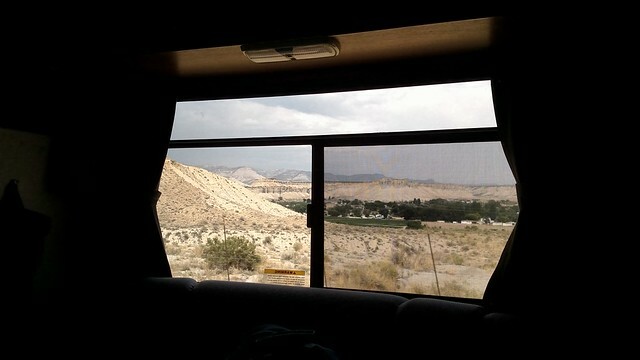 This was our first time traveling in an RV. It was mostly what I expected … easier and quicker to get settled at night than tent camping, especially in the rain, and less moving luggage around than stopping at hotels (though there was some, as in order to have room to stretch out during the day, most of the suitcases had to go in the storage area accessible only from the outside of the rig). It was convenient for Joan to not have to get out at rest stops if she didn’t feel up to it, and to not have to adapt to a new environment every night. The biggest surprise and biggest drawback was how loud it was in motion … the engine noise reverberated around the space and made conversation with anyone who wasn’t close very difficult. I’m guessing that was because this was a rental unit intended to be sturdy and easy to clean rather than fitted out with fancy sound-deadening features. I’m glad we did it, but I don’t have any desire to sell all our stuff and live on the road in one. This album on Flickr has all the photos I chose to upload from the journey. Now I just need to recap our September travels and I’ll be all caught up. As of right now, we’re planning to stay put at home in October, catch up on some things here and enjoy the autumn to winter transition (we had our first snowfall already, though it was melted by noon).